I always preach only one thing i.e. "The Internet is not written in pencil, It's written in Ink" and in most of the cases it has been proved right and everyone needs to be careful while working on the Internet. Anything written on the internet belongs to any specific person or a member of the company, etc. holding a copyright of the same. Copyright has never been an easy, black-and-white kind of issue. Arguments over copyright between creatives happen all of the time, it’s an unending issue and no one can escape from it. In a precise note, one can conclude that somebody claimed this post as his property[via DMCA] but deep in my knowledge, I didn't copy it from anywhere from the internet. DMCA demanded me "DO NOT republish the post(s) as-is. If it is brought to our attention that you have republished the post without removing the content/link in question, then we will delete your post and count it as a violation on your account. Repeated violations to our Terms of Service may result in further remedial action taken against your Blogger account including deleting your blog and/or terminating your account." But they always give a chance to protect yourself and to prove that you are the real owner of the property. I was in need to fill the form for the proper evaluation of the case and to defend myself from the serious legal troubles. After the post processing of the case which took approximately 21 days. Finally, I was proven guiltless and my blog post was restored back to its normal state. But somewhere deep in my mind was curiosity which demanded me to get to know the name of the person who raised a claim against me. 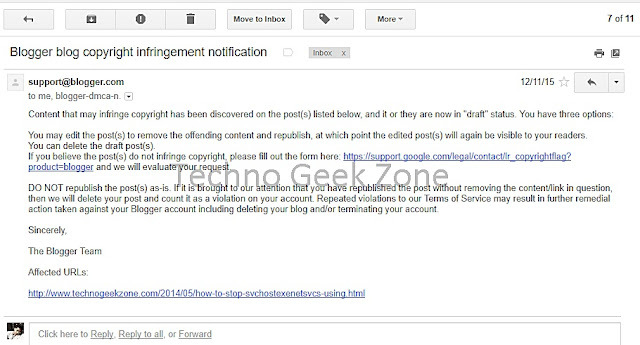 After 1 week, I sued more than 10 blogs who had a replica of my post on their blog. Later on, Techno Geek Zone got protection from DMCA.org on the blog which is defending across lakhs of its directories on the Internet. 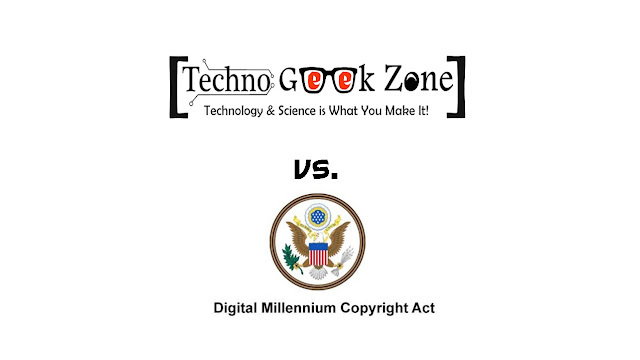 This was the first copyright infringement case for my blog Techno Geek Zone but not the last, later I realised the value of privacy concern and raised 4 claims against some competitors who had copied from the blog out of which I won 3 cases and 1 case led to the decision of mutual settlement. What I actually got to learn is that never create a derivative work that subtracts value from the original artist. Copyright © 2017. Techno Geek Zone [Techno Geek Network]. All rights reserved.